← Beware of the incoming cold in Santa Cruz! 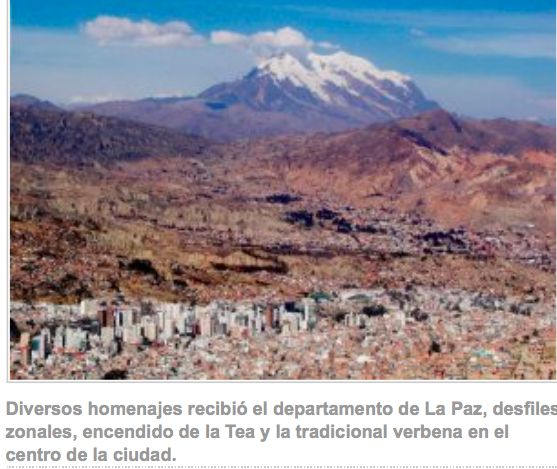 During the month of July the department of La Paz remembers its anniversary, in this year, it is commemorated 208 years of the libertarian shout, among musical tributes can not miss the Tango Illimani, composed to remind the city seat of Bolivian government. According to historical data, the famous Tango Illimani was born between December 31, 1932 and January 1, 1933, in the midst of a confrontation between Bolivia and Paraguay. One of his fighting companions, Benjamín Saravia Ruelas, recalls that on that December night they saw Néstor Portocarrero, with a paper in which he wrote the pentagram of what was to be the Illimani Tango, they watched him, very excited because they knew him as Musicologist and also tears fell every moment, before the memories that evoked the letter and the memories of his beloved city of La Paz and the neighborhoods that he marked in its composition. That is why this composition has a high emotional and civic sense, because in the midst of the Chaco war and before the inspiration that showed him Sopocachi, Miraflores, the silver moon, the serenades, friends, beer and sirens of Lake Titicaca, he designed the letter and the music, in spite of the crisis that surely altered him, that is to say the warlike conflict. And here we can remember Albert Einstein who said that in crises is where a human being finds his gifts and his creativity to get ahead. And that is why this tango is considered the second hymn of La Paz. Néstor Portocarrero passed away in 1948, when the IV Centennial of the foundation of this city was fulfilled. Portocarrero graduated from the School of Military Music and later moved to Argentina where he was part of the Argentine orchestra “Charlie”, as a drummer. He returned to Bolivia in 1925, and in 1930 he toured Potosí and Sucre as a drummer with the Argentine orchestra Basilio – Guidice, until the Chaco War summoned him as part of the second Bolivar Regiment of artillery and fought at Alihuata and Fortín Ballivián. The author has other compositions such as Cielo Paceño (tango), Intima (waltz), Oh Cochabamba (tango), Madrecita (tango – song), and Canillita (tango). My opinion: I listened to the Illimani tango when I was a kid, and enjoyed the lyrics and of course, the tango rhythm … afterwards I was fascinated when I learned that the tango was an Argentinian creation … I always thought it was cool that such a son was created about our beautiful Illimani and lovely La Paz city. This entry was posted in Art, Bolivia, Holidays, La Paz, Tourism and tagged Bolivian heritage, Chaco War, history, music. Bookmark the permalink.